I stayed away from coffee shops for several years. I was saving money and since building the houseboat cabin and moving off a tiny sailing boat into a relatively palatial abode, I preferred to make good coffee at home. This Summer some friends bought me a take-out Costa Coffe soya latte. My reaction was ‘Yeuch, Costas expensive and muddy bucketfuls of corporate coffee!’ To my surprise it was delicious. So I made a deal with myself – as long as I took my saxophone with me I would be allowed to spend £2.45p on a soya latte. The significant expense would be covered easily by busking, Costa Coffee is in the heart of Woodbridge and after a caffeine boost I’d play for a few hours. My whole daily routine has changed. I used to spend at least an hour doing morning chores, washing-up, making tea, having breakfast, clean my teeth, check my diary and eventually surface into the wider world to walk Loba along the familiar river path. Since my Costa Coffee Rationale I now get out of bed, put on my jeans, shoes, jacket and walk straight up into the Thouroughfare. Loba the dog loves waking and going straight out without enduring those tedious domestic chores. The only condition is that however sleepy and disinclined I feel when I wake, I must take my saxophone with me. It works. As time went on I began to use the coffee terrace as my office. I sit there, watching the shops open around 9 am, I socialise with a new raft of locals and visitors. One motorcyclist always gives me his Motorcycle News after he has read it. I spend time on my smart phone, organising emails, diary, music theory notes. Occasionally I sit with headphones, listening to music as inspiration for busking songs. The acacia tree in front of the terrace is a beautiful green, it gives cool shade and a swish of natural presence to the street scene. The location, a relaxing milieux in the centre of the Thouroughfare is occasionally a melee of competition for chairs or a rumble of moaning about the queue inside at the counter. 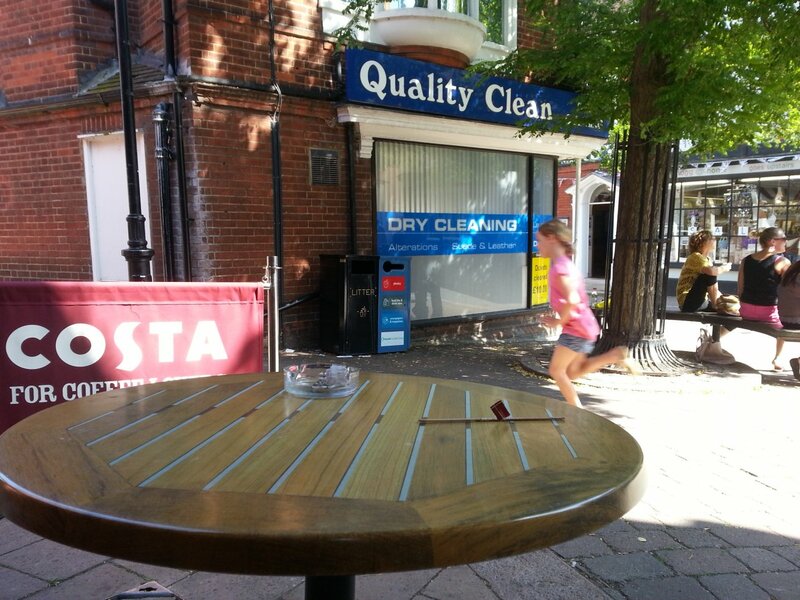 More often I find an empty table and take my place easily, in the soft rural style of small Suffolk towns. Life has altered for ‘Loba’ too, we get straight up and out in the morning and spend whole days in town, between my busking pitches and ‘the office’ – Costa Coffee terrace – entertaining people and meeting them. Nowadays I adore the smell of fresh roasting coffee more than ever before, with the re-grooved associations: a pocketful of coins; hours of saxophone practice daily; chatting to new people; and doing what I love most the long whole days through of Summer 2012.